A week late on the cinnamon rolls, but they’re finally happening! And they’re so good. I can’t wait for you to make this special holiday treat. Cinnamon rolls have become synonymous with Christmas in our home. We aren’t big tradition people, but we do have a few special traditions that make Christmas special to us. Among these traditions, homemade goodies top the list. A couple of years ago, I thought it would be fun to make homemade hot chocolate with the kids. 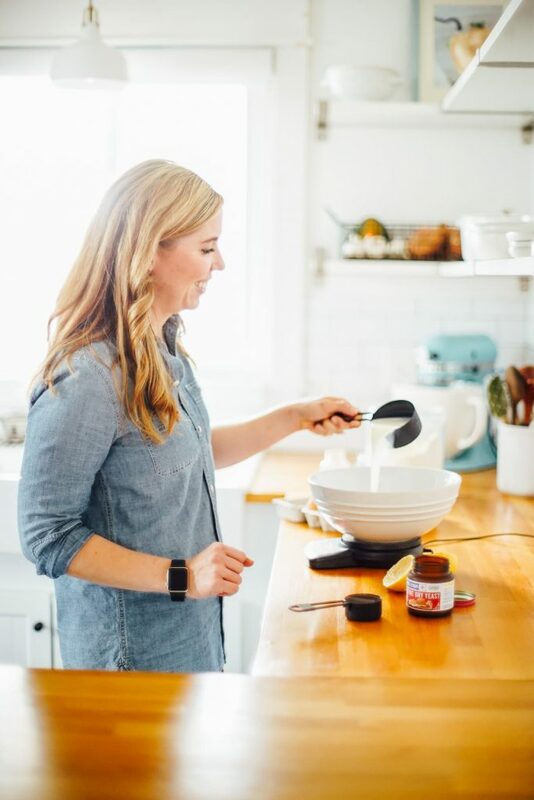 That one experience left a lasting impression on the kids and now every holiday season Piper suggests, “We must make hot chocolate!” This request continues throughout the month of December until we can’t bear another mug of homemade hot cocoa. As I mentioned, cinnamon rolls have also become a Christmas tradition. 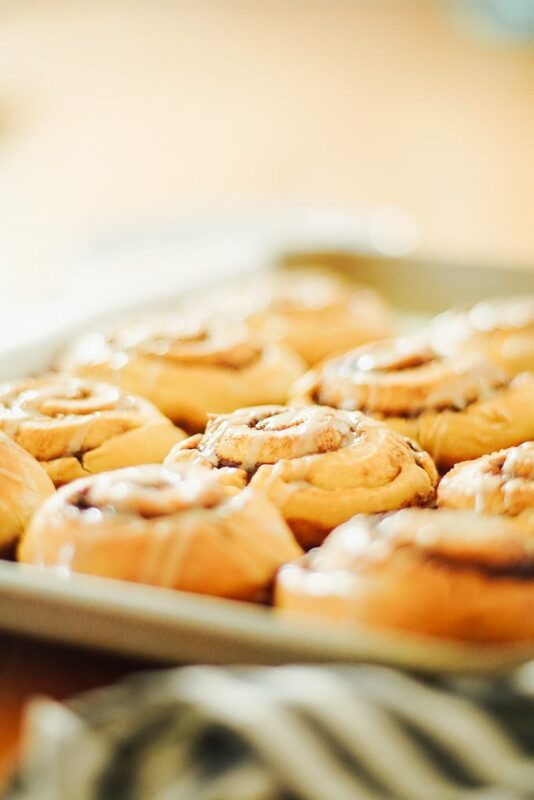 Although cinnamon rolls don’t frequent our table as often as the regular cup of cocoa. Our tradition is to make cinnamon rolls on Christmas morning. A few years ago, I shared a homemade cinnamon roll recipe that calls for whole wheat pastry flour and an overnight fridge method. 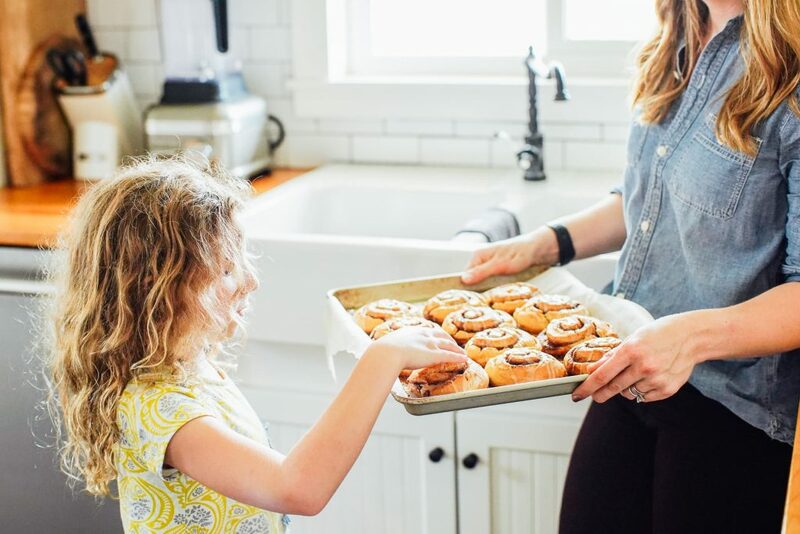 The cinnamon rolls have become a favorite for many readers over the years. This year, I wanted to try an einkorn version. As you probably know, earlier this year, I visited a functional medicine doctor where I had some testing done on my gut. The results came back that my gut needed some TLC. At the time, I tested positive for a sensitivity to gluten and parasites. 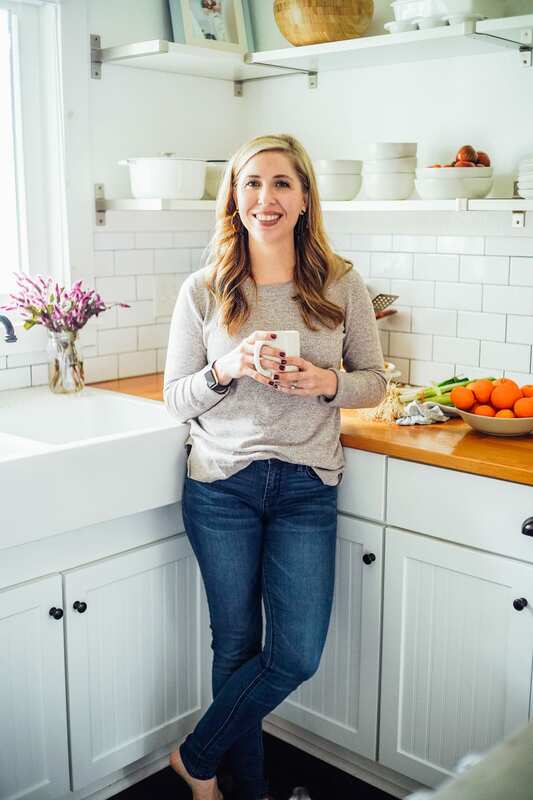 For four months, I went on a gluten-free diet that also included making some lifestyle changes (stress management, which I think will be the story of my life) and adding healing supplements. After this protocol, my gut was tested again and everything came back A-okay. I was cleared to consume gluten, but in limited quantities. Since this time, I’ve been very selective about my gluten consumption. I no longer consume gluten when I’m out and about. Instead, my gluten consumption is reserved for einkorn and sourdough. Einkorn and sourdough sit well with my gut, unlike other forms of gluten. 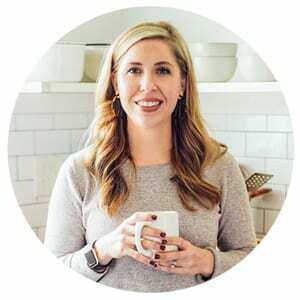 In January, when we return from Europe, I’m going to share a podcast interview with Carla, the founder of Jovial Foods. Jovial Foods is my source for einkorn flour, and one of the leading einkorn growers/producers. I can’t wait for you to hear this interview and her story. To say that my love for einkorn deepened after talking to Carla is an understatement. I’ve known just enough about einkorn and why it sits well with me, particularly as someone with a slight sensitivity to gluten, but now I have an even greater understanding of this amazing grain. Needless to say, I’ll definitely be doing more einkorn exploration in 2019. For now, if you’re new to einkorn, let’s just touch on the important stuff: what einkorn is and why it’s so special. 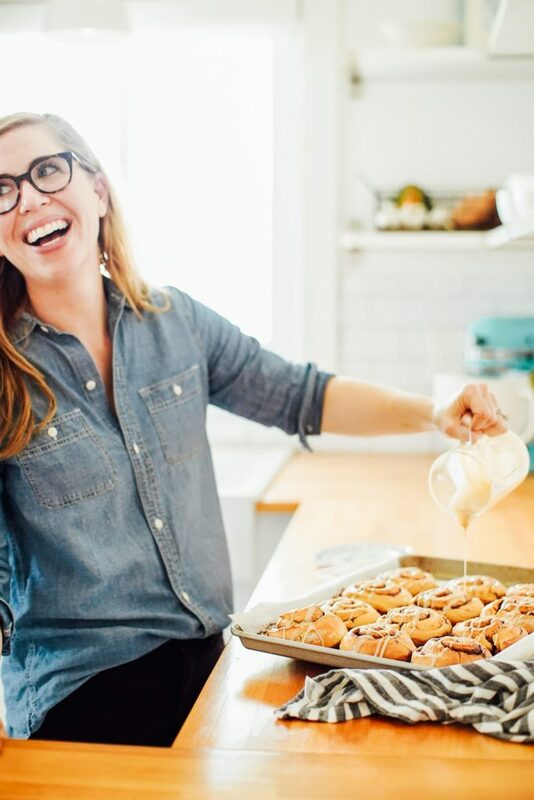 Then we’ll talk about why you need to make einkorn cinnamon rolls. Einkorn is known as the oldest variety of wheat making it an “ancient” grain. The ancient grain is believed to have originated in the Tigris-Euphrates region and is possibly the main grain referenced in the earliest accounts of the Bible. Einkorn is said to be the wheat men were eating in the earliest days before modern day wheat varieties. While modern wheat has undergone hybridization, einkorn still holds true to its original properties. Einkorn is slowly gaining popularity, but is still grown in only a few regions in Europe. Einkorn is my favorite flour to work with when making traditional, flour-based baked goods. The sweet, ancient grain has a lighter texture and taste than modern day wheat, and contains a more favorable gluten ratio. One of the reasons I love using einkorn is because of how easy it is to work with. Einkorn doesn’t like to be fussed with, so it doesn’t require much of any kneading. 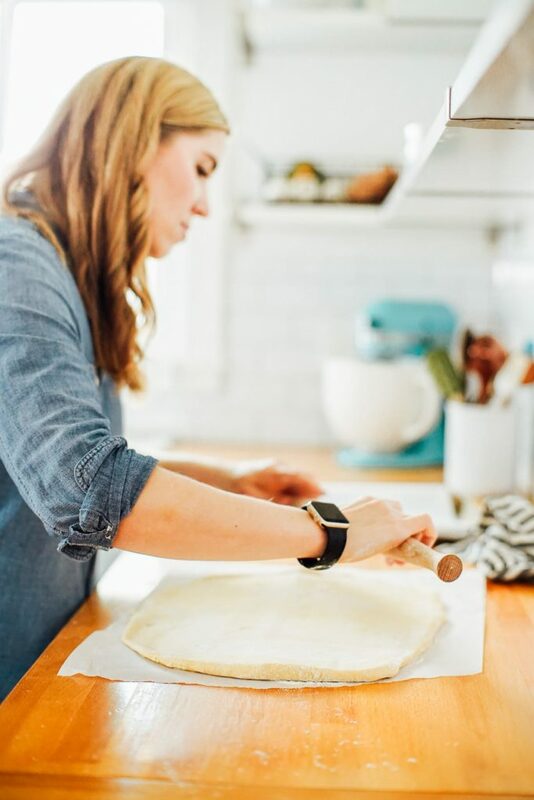 This makes the process of making a yeasted bread or pastry, like cinnamon rolls, an incredibly simple and hands-off process. The other plus to using einkorn is the flavor. Einkorn has a very unique flavor and color (yellow). The light, slightly-sweet flavor produces the most amazing baked goods. Both of these attributes–the flavor and color– shine through in today’s recipe. Today’s cinnamon rolls are a mix between a bread and a pastry, just sweet enough to enjoy as a treat but not too sweet. They are incredibly easy to make and don’t require any special tools or instructions. 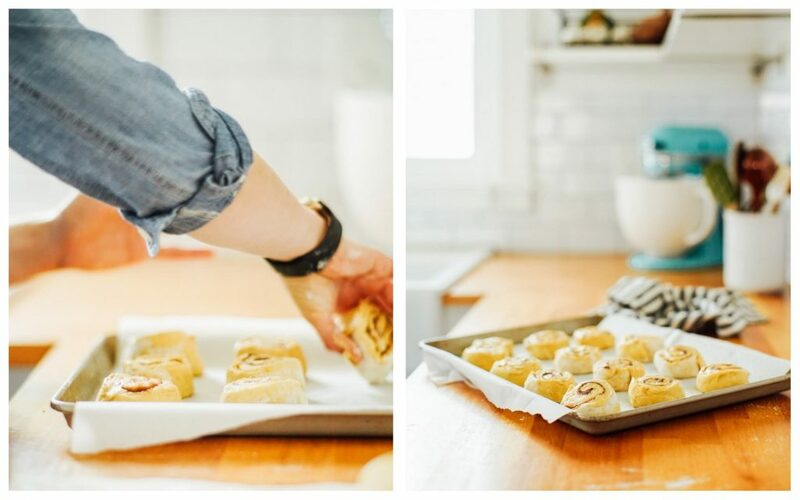 If you can mix and roll out dough, you can make these delightful cinnamon rolls. 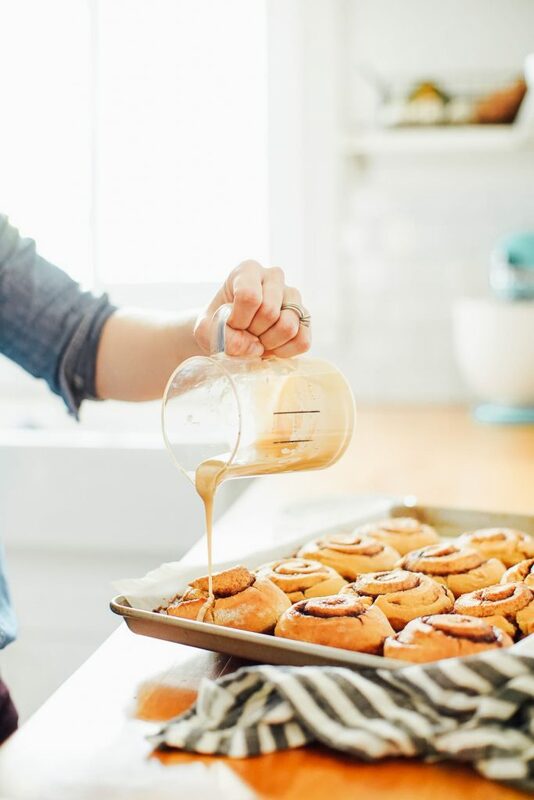 An easy, one-bowl, no-knead cinnamon roll recipe made with ancient einkorn flour. In a large bowl, combine the warm milk and lemon juice. Let this mixture rest for 5 minutes. Add the yeast and whisk to combine the yeast with the milk mixture. Let rest for 5 minutes. Whisk in the melted butter, eggs, maple syrup, and cinnamon. Finally, add the flour and salt. Combine the ingredients until they begin to come together to form a jagged, sticky ball. Cover with a towel and let rest for an hour. After an hour, place a sheet of parchment paper on a surface. Sprinkle with flour (about 1/2 tablespoon). Add the dough. Sprinkle a bit of flour over the surface of the dough (another 1/2 tablespoon or so). 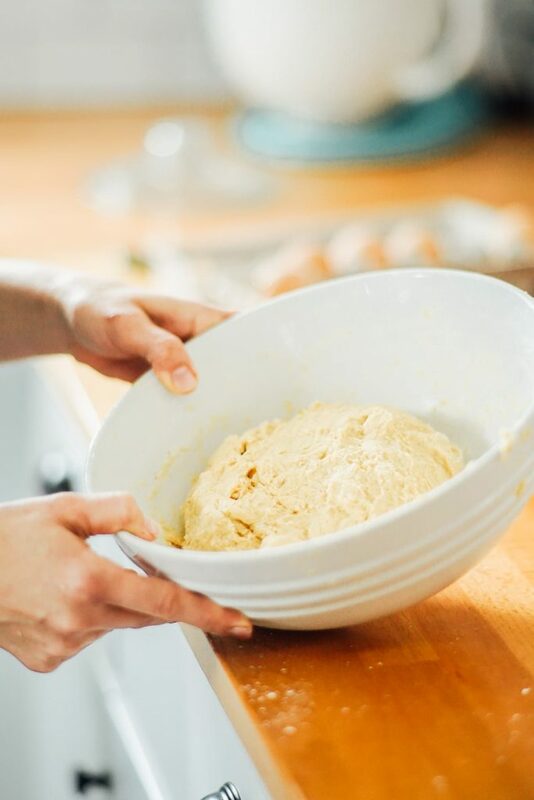 Knead the dough just until it forms a smooth ball--just a couple of "turns" of the dough. 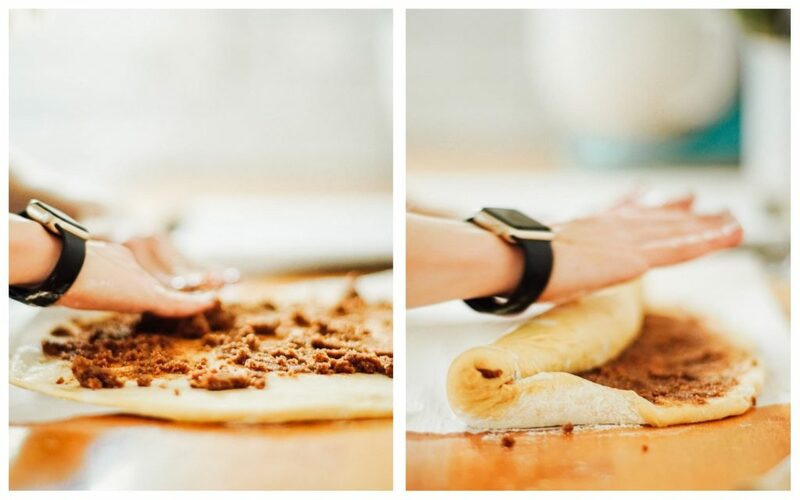 Roll the dough out with a rolling pin, flipping the dough if it becomes too sticky. There should always be some flour between the rolling pin and dough to prevent sticking. 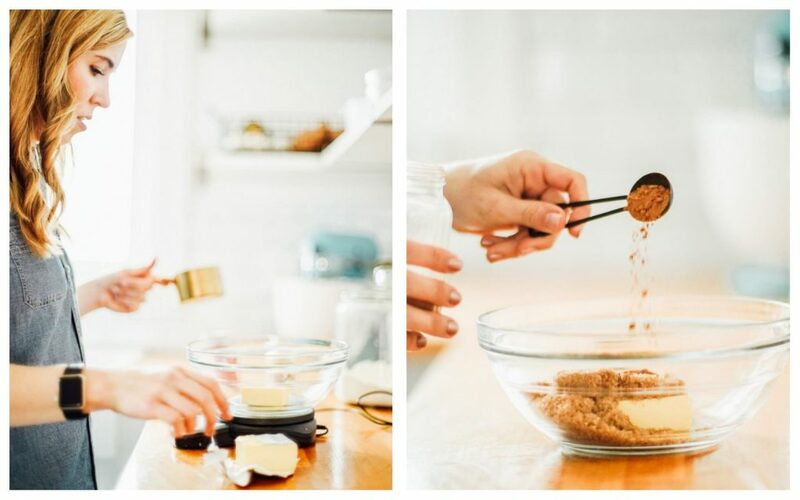 In a large bowl, use a hand-mixer to cream together all the filling ingredients: brown sugar, flour, butter, cinnamon, cardamom, and salt. Pour the filling over the dough and use your fingers (or a large spoon) to rub the filling evenly over the entire surface. Roll up the dough as tightly as possible. Cut the dough into 12 even slices. Place the slices on a parchment-lined sheet pan. They should be about an inch apart. Cover the cinnamon rolls with a clean towel and let the rolls rest for 30 minutes. Preheat the oven to 400F. After 30 minutes, uncover the rolls and bake for 20-22 minutes, until golden brown. 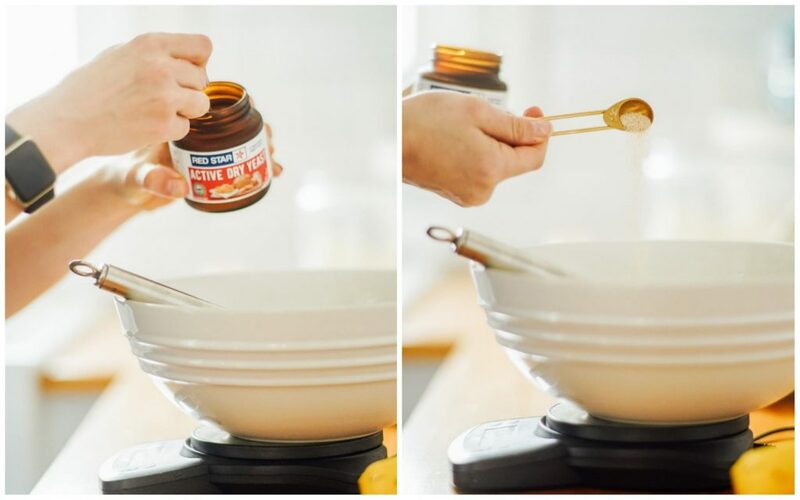 In a small bowl, whisk together the glaze ingredients until smooth. Drizzle the glaze over the cooled cinnamon rolls. I personally think the glaze is optional. 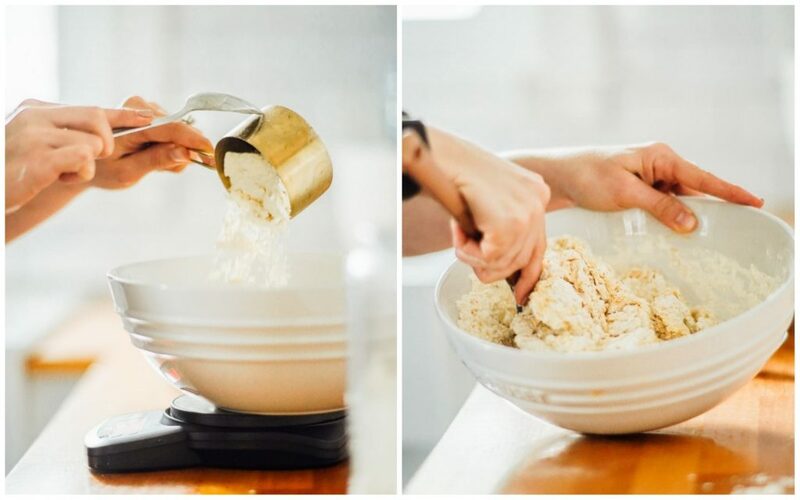 If you don't have a scale to weigh the ingredients (which I highly recommend), spoon the flour into the measuring cup versus scooping it with a measuring cup. Yay! You’re back! There is something so satisfying about foods made with einkorn. 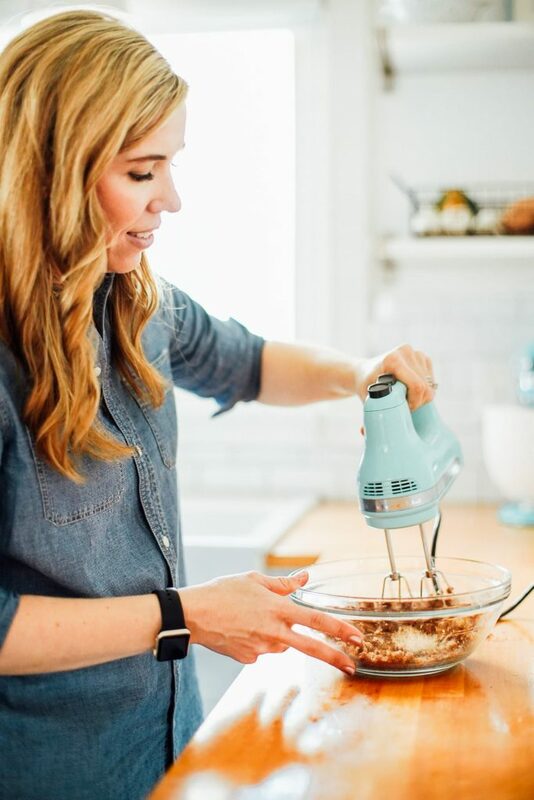 Looking forward to your ever expanding einkorn recipe collection in 2019. Thank you, Katie! For sure. I want to experiment with einkorn berries, too, in savory dishes. Talking to Carla was so inspiring! Yes! 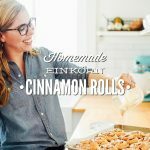 I was hoping you would come out with an einkorn cinnamon roll recipe, I can’t wait to try this. Since finding your blog we have switched completely over to einkorn (thanks to your easy recipes) and it’s helped my son tremendously. Thank you so much, keep it up! That’s so great to hear, Karli! Enjoy!! These look delicious!! I’m planning on trying these out this week. Thanks for sharing! Do you think these could be made up through the slicing then kept covered with plastic wrap in the fridge to bake off in the morning? 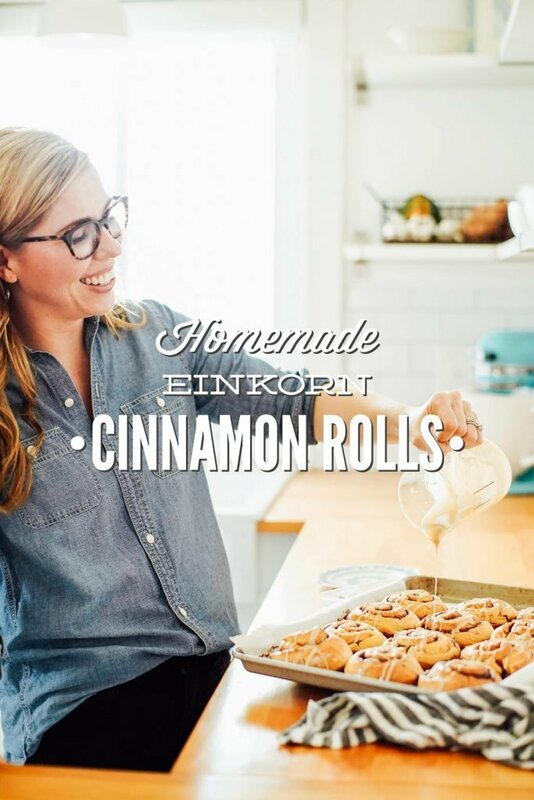 Hey Sarah, I’m so glad you’re enjoying einkorn. I’m not sure if these will work as an overnight recipe, but it’s worth a try. Can’t wait to try these. I would also like to know if you could keep in the fridge overnight. I would like to make these for Christmas morning but don’t want to be making that morning. Please comment if you’ve put these in the fridge overnight and baked the next morning! Hey Emily, I haven’t tried an overnight method with these, so I’m not sure how they’ll turn out. If I get a chance to try that in the next couple of days, I’ll let you know. Would this work with a nut or coconut milk instead? Or is the lactose needed to the yeast? We have a couple family members who can’t have dairy. Hey Nicole, Yes, it will :). Even water will work, although I recommend a milk of some sort.